A mobile separator in stainless steel with nearly no maintenance and no need for consumables except 10 litres of compressed air per day for self-cleaning of the separator. This machine includes a 3-phase lamella separator for separation of tramp oil and solid particles out of the process fluid (e.g. washing liquid and cutting coolants). 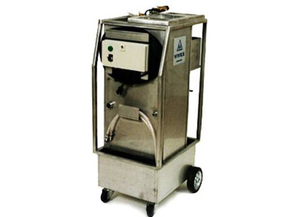 The system is built on a cart and includes a floating suction device as well as hose with quick connections to the separator.